Stylosanthes guianensis (Aublet) Sw. is a tropical forage legume with soil acidity tolerance and excellent adaptation to infertile soils, but sensitive to chilling. To understand the molecular responses of S. guianensis to chilling, differentially expressed genes between a chilling tolerant mutant 7–1 and the wild type were identified using suppression subtractive hybridization, and eight of them were confirmed and the regulation pattern were analyzed using quantitative reverse transcription PCR (qRT-PCR). Chloroplast protein 12 (CP12) functions to regulate the Calvin cycle by forming a ternary complex with glyceraldehyde 3-phosphate dehydrogenase (GAPDH) and phosphoribulokinase (PRK). SgCP12 transcript was induced by chilling in both plants, and higher levels were observed in 7–1 than in the wild type, implying a potential role of SgCP12 in chilling tolerance. To confirm this, transgenic S. guianensis plants over-expressing or down-regulating SgCP12 were generated, respectively. Higher Fv/Fm and survival rate and lower ion leakage were observed in transgenic plants overexpressing SgCP12 as compared with the wild type after chilling treatment, while lower Fv/Fm and survival rate and higher ion leakage were found in SgCP12 antisense plants. 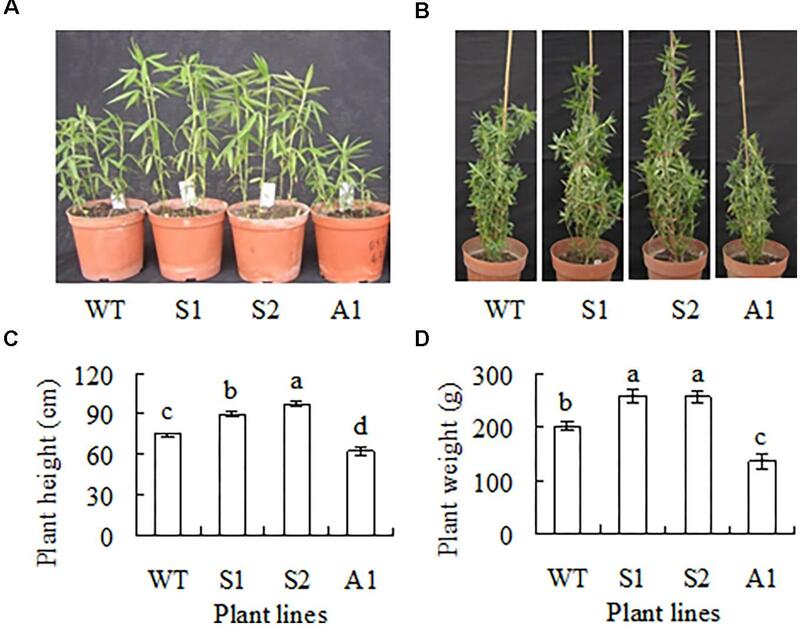 SgCP12 overexpression plants showed promoted growth with increased plant height and fresh weight, while the antisense plants exhibited reduced growth with decreased plant height and fresh weight as compared with the wild type. The results indicated that regulation of SgCP12 expression alters plant growth and chilling tolerance in S. guianensis. In addition, higher levels of net photosynthetic rate (Pn), GAPDH and PRK activities were observed in SgCP12 overexpression transgenic plants, while lower levels in antisense plants than in the wild type under both control and chilling conditions, indicating that altered activities of GAPDH and PRK were associated with the changed Pn in transgenic S. guianensis. Our results suggest that SgCP12 regulates GAPDH and PRK activities, Pn, and chilling tolerance in S. guianensis. Temperature is one of the major abiotic stress influencing plant growth and development. Perennial temperate plants can be survival under freezing temperatures through a mechanism called cold acclimation, while tropical plants is damaged or even dead after exposing to chilling conditions due to the lack of cold acclimation mechanism. Thousands of genes are reprogrammed in expression and multiple metabolic pathways are modified in both temperate and tropical plants in response to low temperature (Fowler and Thomashow, 2002; Krasensky and Jonak, 2012; Zhang et al., 2012). The Calvin–Benson cycle enzymes are more sensitive to low temperature than photochemical reactions, which reduces the utilization of light energy absorbed by chlorophyll and results in an elevated production of reactive oxygen species (ROS) (Allen and Ort, 2001; Alam and Jacob, 2002). The accumulated ROS may induce gene expression as a second messenger in signal transduction, or result in oxidative damages to photosynthetic apparatus and even lead to plant death if ROS could not be effectively scavenged (Foyer and Noctor, 2009). Stylosanthes guianensis (Aublet) Sw. is a tropical forage legume with soil acidity tolerance and excellent adaptation to infertile soils (Jiang et al., 2005). It is commonly used as a cover crop in southern China as well. Unfortunately it is sensitive to chilling. Our previous investigations using growth chamber showed that S. guianensis seedlings were damaged upon exposure to low temperature at 10°C (Zhou et al., 2005a). Application of abscisic acid (ABA) increased its chilling tolerance through induced antioxidant defense system (Zhou et al., 2005a) and protected photosystem II (PSII) of photosynthesis (Zhou et al., 2006), while nitric oxide (NO) and Ca2+ are involved in ABA induced antioxidant defense (Zhou et al., 2005b; Zhou and Guo, 2009). Three gamma-ray-irradiated mutants with increased chilling tolerance have been selected. The mutants maintained higher antioxidant activities and higher net photosynthetic rate (A) during chilling (Lu et al., 2013). However, the molecular responses to chilling in Stylosanthes guianensis have not been revealed. In order to understand the mechanisms of chilling tolerance in S. guianensis, suppression subtractive hybridization (SSH) was conducted in the group to identify the differentially expressed genes in response to chilling between a chilling tolerant mutant 7–1 (Lu et al., 2013) and its wild type. One hundred and ninety-four sequences were harvested after confirmation by reversed Northern blot and the false positives were removed, and they have been subjected to a BlastX or BlastN comparison to the GenBank database online1. The largest group was classified as chloroplast and photosynthesis related genes including CP12 (unpublished data), implying an association of the group of genes with chilling tolerance in S. guianensis. A chloroplast protein CP12 has been found to regulate the Calvin cycle by forming a ternary complex with GAPDH and PRK, the key enzymes of the Calvin–Benson cycle (Graciet et al., 2004; Marri et al., 2009; Howard et al., 2011). The GAPDH/PRK/CP12 complex forms in vivo and results in a reduced activity of PRK and GAPDH under low light or in the dark, while it disassociates under light conditions and leads to an increased activity of GAPDH and PRK (Howard et al., 2008; López-Calcagno et al., 2014). GAPDH and PRK activities are inhibited by oxidants such as H2O2, oxidized glutathione (GSSG) and nitrosoglutathione (GSNO), while the GAPDH/CP12/PRK complexes are protected from treatments with oxidants in Arabidopsis. The results imply that CP12 protects GAPDH and PRK from oxidative stress (Marri et al., 2014). Three CP12 homologs, CP12-1, CP12-2, and CP12-3, are found in the genomes of Arabidopsis, rice and maize genome. Compared to CP12-3, CP12-1, and CP12-2 are highly homologous (López-Calcagno et al., 2014). The three CP12 genes are differentially expressed in Arabidopsis (Marri et al., 2005; Singh et al., 2008). CP12-2 expression depends upon light, which is similar to GAPDH and PRK, and is highest in photosynthetic tissues, while CP12-1 is expressed in a range of tissues including photosynthetic tissues, root tips, flowers, and seeds. CP12-3 is major expressed in roots, stigma and anthers (Singh et al., 2008). CP12 is required for plant growth and development. Carbon allocation to the cell wall and organic acids is increased and carbon going to starch and soluble carbohydrates is decreased in CP12 antisense plants which showed a phenotype of dwarfism and reduced apical dominance (Howard et al., 2011). No severe photosynthetic or growth phenotype was observed in Arabidopsis single cp12-1, cp12-2, and cp12-3 mutants, but reduced transcripts of both CP12-1 and CP12-2 lead to reduced PRK protein level and photosynthetic capacity and a phenotype with slower growth and reduced seed yield in double or triple mutants CP12-1/2 and CP12-1/2/3 (López-Calcagno et al., 2017). However, it is unknown what phenotypes display in transgenic plants overexpressing CP12. Response of CP12 expression to low temperature and the role in chilling tolerance have not been reported. 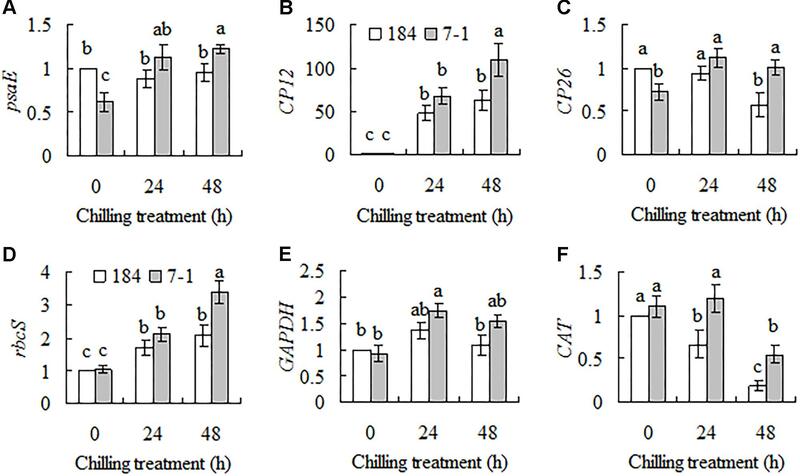 The objectives of this study were to identify the differential expressed genes in response to chilling and to examine the role of CP12 in chilling tolerance using transgenic S. guianensis plants overexpressing or down-regulating CP12 expression. 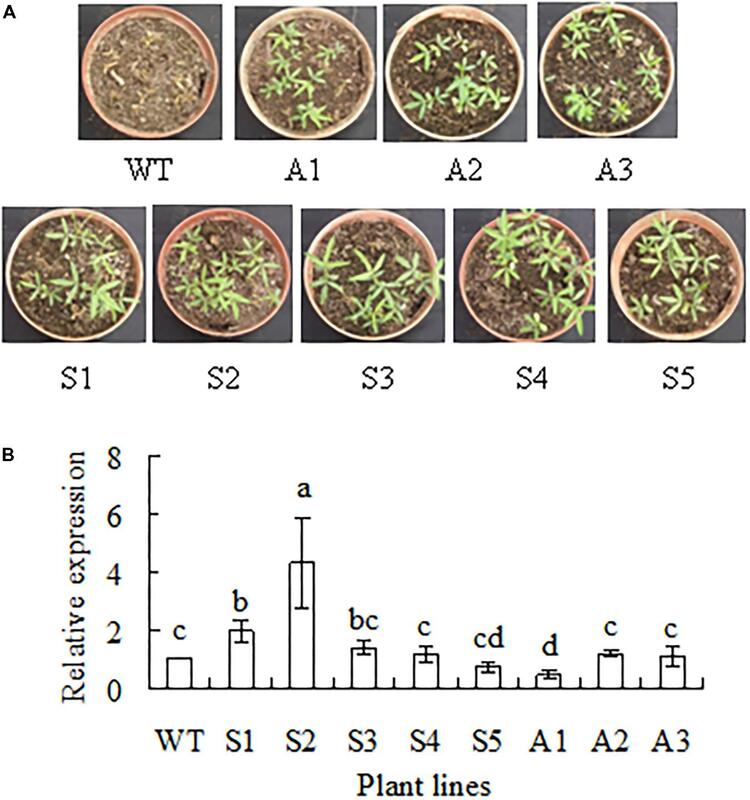 Ten seedlings of the chilling-tolerant mutant 7–1, homozygous lines (T3) of transgenic S. guianensis plants overexpressing SgCP12 or down-regulating SgCP12 expression and the wild type (S. guianensis cv. CIAT184) were planted in 15-cm diameter plastic pots, respectively, containing mixture of peat and perlite (3:1, v/v), growing under natural light in a greenhouse at temperature from 25 to 30°C as previously described (Lu et al., 2013). For isolation of total RNA, one-month-old seedlings of 7–1 and the wild type plants were placed in a growth chamber for 2 d at 6°C with a 12-h photoperiod under light of 250 μmol m-2 s-1. For physiological measurements, two-month seedlings of transgenic plants and the wild type were placed in a growth chamber at 6°C for 8 d as described above, followed by sampling the second leaflets from the top. Then the plants were moved to room temperature for 1 week of recovery, and survival rate was measured. All experiments are replicated three times. Total RNA was isolated from the second leaflets from the top at 0, 6, 24, and 48 h after chilling treatment, respectively, using TRIzol reagent (Invitrogen, Carlsbad, CA, United States). 1 μg of total RNA was used for synthesis of first-strand cDNA using the PrimeScript RT reagent Kit with gDNA Eraser (Takara, Shiga, Japan). PCR reaction mixture (10 μl) contained 15 ng of diluted cDNA template, 200 nM each of forward and reverse primers, and 5 μl SYBR Premix Ex Taq (Takara, Shiga, Japan). Parallel reactions to amplify Actin1 were used to normalize the amount of template. The primers and their sequences are listed in Supplementary Table S1. qRT-PCR was conducted in Mini Option Real-Time PCR System (Bio-Rad, CA, United States) according to the manufacturer’s instructions. A negative control without cDNA was always included. Relative expression was calculated by 2-ΔΔCt, which was done automatically by the instrument. When compared the gene expression in transgenic plants or the mutant 7–1 with that in the wild type, relative expression was calculated based on defining gene expression in the wild type as one. A 627 bp cDNA sequence of CP12 (FE192311.1) was recovered from the SSH cDNA library of S. guianensis. It contained the stop codon but lack a 45 bp fragment at the 5′-end. It is mostly homologous to pea CP12 (CAA96570). For amplification of the remaining coding sequence of SgCP12, therefore, a forward primer ZG1129 (CAGAGGAAAAATGGCGACC) was designed based on the sequence of pea CP12, while the reverse primer ZG1130 (CTGATTATGAGGGCGGTTACA) was designed based on S. guianensis CP12 cDNA (FE192311.1). PCR reaction mixture contained primers ZG1129 and ZG1130, the first-strand cDNA as the template, and KOD-Plus DNA polymerase (TOYOBO, Osaka, Japan). DNAMAN software (Lynnon Biosoft, Vaudreuil, Quebec, CA, Canada) was used for analysis of the deduced amino acid sequence of SgCP12. The coding sequence of SgCP12 was cloned to expression vector pCAMBIA3301 in sense or antisense direction under driven by CaMV 35S promoter. Cotyledons from 7-day-old seedlings was infected in suspension cells of Agrobacterium tumefaciens strain EHA105 harboring the expression construct, and transgenic S. guianensis plants were generated as described previously (Bao et al., 2016). One rooted plant from each Basta-resistant callus (independent transformant) was kept for transplanting to soil in plastic pots and grown in greenhouse. Transgenic S. guianensis plants were selected by spraying with 60 mg l-1 Basta herbicide at seedlings stage of T0, T1, and T2 plants to collect homozygous lines, and the survival plants were further confirmed by using PCR for detecting bar with primers ZG1409 (CAGCTGCCAGAAACCCACGT) and ZG1410 (CTGCACCATCGTCAACCACT). For evaluation of chilling tolerance, ion leakage and maximal photochemical efficiency of PSII (Fv/Fm) were measured after 8 d of chilling treatment at 6°C in growth chamber as described previously (Lu et al., 2013; Bao et al., 2016), while survival rate was measured based on recording the surviving plant numbers and total numbers in one pot after 7 d of recovery at room temperature post chilling treatment. Net photosynthetic rate was measured as described previously (Zhou et al., 2006), using a LI-6400P Portable Photosynthesis System (LI-COR Inc., Lincoln, Nebraska, United States), by controlling leaf temperature at 25°C, CO2 concentration at 400 μmol l-1 and relative humidity at 70%. Leaves were detached from plants with illumination for 2 h under light of 500 μmol m-2 s-1 and extracted in 1 ml of ice-cold extraction buffer containing 100 mM Tricine (pH 8.0), 10 mM MgCl2, 20 mM KCl, 1 mM EDTA, 5 mM DTT, and 0.05% Triton ×-100 (v/v), 5% glycerol (v/v), 1% PVP. The homogenates were centrifuged at 15,000 × g for 15 min, and the resulting supernatant was used for assay of PRK and GAPDH (Howard et al., 2011). PRK was assayed in reaction mixture containing 50 mM HEPES (pH7.8), 10 mM MgCl2, 40 mM KCl, 1 mM ATP, 4 mM DTT, 0.1 mM NADH, 2 units mL21 pyruvate kinase, 1 mM phosphenolpyruvate, 0.5 mM ribulose-5-phosphate, 2 units ml-1 lactate dehydrogenase, 2 units ml-1 pyruvate kinase, and the reaction was initiated by addition of the enzyme extract in a total reaction volume of 1 ml. GAPDH activity was assayed in reaction mixture containing 50 mM Tris–HCl (pH 7.8), 10 mM MgCl2, 1 mM EDTA, 2.5 mM ATP, 4 mM DTT, 0.1 mM NADPH, 5 mM 3-phosphoglyceric acid, 2 units ml-1 3-phosphoglyceric phosphokinase and initiated by addition of the enzyme extract in a total reaction volume of 1 ml. Aldolase activity was assayed in reaction mixture containing 50 mM Tris–HC (pH 8.5), 1 mM EDTA, 5 mM MgCl2, 2 mM fructose-1,6-biphosphate (FBP), 0.15 mM NADH, 5 units ml-1 triosephosphate isomerase, 2 units ml-1 glycerol-3-phosphate dehydrogenase and initiated by addition of the enzyme extract in a total reaction volume of 1 ml. Fructose-1,6-bisphosphatase (FBPase) was assayed in reaction mixture containing 100 mM Tris–HCl (pH8.2), 5 mM MgCl2, 4 mM fructose-1,6-bisphosphate, 0.5 mM NADP, 2 units ml-1 phosphoglucose isomerase, 1 units ml-1 glucose-6-phosphate dehydrogenase, and the reaction was initiated by addition of the enzyme extract in a total reaction volume of 1 ml. All data were subjected to analysis of variances (ANOVA) according to the model for completely randomized design using an SPSS program (SPSS Inc, Chicago, IL, United States). Differences among means of plant lines were evaluated by Duncan test at 0.05 probability level. Eight genes showing differential expression between a chilling tolerant mutant 7–1 and the wild type in SSH library were selected for confirmation, and a time course of transcripts in response to chilling stress was measured using qRT-PCR. Five genes are involved in photosynthesis, including psaE (encoding photosystem I reaction center subunit psaE), CP12, CP26 (encoding chloroplast protein 26), rbcS (encoding Rubisco small subunit) and GAPDH, and the other one CAT (encoding catalase) is stress related. Compared to unaltered psaE transcript in the wild type, continuous induction in psaE transcript was observed in mutant 7–1 during chilling stress (Figure 1A). SgCP12 transcript was continuously and greatly induced in both 7–1 and the wild type during chilling treatment, and higher level was observed in 7–1 than in the wild type after 48 h of chilling (Figure 1B). CP26 transcript was decreased in the wild type after 48 h of chilling treatment, but it was induced in 7–1 after 24 h of chilling (Figure 1C). Rubisco is consisted of four large subunits (rbcL) and four small subunits (rbcS) and catalyzes fixation of CO2 by ribulose-1,5-bisphosphate (RuBP). rbcS transcript was induced continuously in both 7–1 and the wild type, and higher level was observed in 7–1 after 48 h of chilling (Figure 1D). GAPDH transcript was not altered significantly in the wild type during chilling treatment, while that was slightly induced in 7–1 at 24 h after chilling (Figure 1E). CAT transcript was continuously reduced in the wild type after chilling treatment, while it was unaltered in 7–1 at 24 h and decreased at 48 h after chilling. Higher level of CAT transcript was maintained in 7–1 as compared with the wild type at 24 and 48 h after chilling (Figure 1F). FIGURE 1. Analysis of transcript levels of six genes, psaE (A), CP12 (B), CP26 (C), rbcS (D), GAPDH (E), and CAT (F), in response to chilling stress between the chilling tolerant mutant 7–1 and the wild type (S. guianensis cv. CIAT184). Plants were placed in a growth chamber at 6°C for chilling treatment. Actin was used as reference gene for quantitative RT-PCR. Means of three replicates and standard errors are presented; the same letter above the column indicates no significant difference among the tested plant lines at P < 0.05. Given that SgCP12 transcript was greatly induced in response to chilling stress and showed difference between 7–1 and the wild type, it implies that SgCP12 expression might be associated with chilling tolerance. Thus the role of SgCP12 in chilling tolerance was investigated in the present study. The coding sequence of SgCP12 was cloned from S. guianensis: it contains a 399 bp ORF (HQ906668) encoding a putative polypeptide of 132 amino acids (ADZ23481.1). A chloroplast transit peptide exists at the N-terminal region, indicating SgCP12 might be located on chloroplast. SgCP12 is most homologous to PsCP12 in pea (CAA96570) with 65% identification in amino acid sequence. Phylogenic analysis of SgCP12 with CP12 family in Arabidopsis showed that SgCP12 was more similar to AtCP12-2 or ATCP12-1 than AtCP2-3 (Figure 2). FIGURE 2. Phylogenetic relationship between SgCP12 and AtCP12 members in Arabidopsis thaliana. The phylogenetic tree was constructed with the DNAMAN program. The bar represents the branch length equivalent to 0.05 amino acid changes per residue. Transgenic plants expressing SgCP12 driven by CaMV35S promoter and down-regulating SgCP12 expression by antisense approach were generated from individual Basta-resistant callus using bar as selective marker gene. Basta resistance was used to select transgenic plants from T0, T1, and T2 plants, respectively. For example, 75% of T1 transgenic plants were survival, while all the wild type plants were dead after spraying with Basta (Figure 3A). Homozygous lines with resistance to Basta were selected from T2 plants. Among the five lines overexpressing SgCP12 lines S1 and S2 had significantly increased SgCP12 transcript; among three antisense lines A1 had decreased SgCP12 transcript, while in A2 and A3 the transcript level was not altered (Figure 3B). Thus, S1, S2 and A1 were used for further investigation. FIGURE 3. Basta resistance and relative expression of SgCP12 in transgenic plants overexpressing SgCP12 or down-regulating SgCP12 expression in comparison with the wild type (S. guianensis cv. CIAT184). Two-week-old seedlings were sprayed with basta (60 mg l-1) to select transgenic plants, and photography was taken 1 week after spraying with basta (A). Relative expression was measured using quantitative RT-PCR, and actin was used as reference gene (B). Means of three replicates and standard errors are presented; the same letter above the column indicates no significant difference among the tested plant lines at P < 0.05. Plant growth showed a difference between transgenic plants and the wild type after 5 and 12 weeks growth in greenhouse (Figures 4A,B). Plant height was increased by 20 and 30%, and biomass was increased by 29 and 27%, respectively, in lines S1 and S2 as compared with the wild type, while in A1 plant height and biomass were decreased by 17 and 32%, respectively (Figures 4C,D). Lines S3, S4, S5, A2, A3, and 184 showed no difference in plant height and fresh weight of shoots (data not shown). The results indicated that up-regulation of SgCP12 expression resulted in promoted growth, while down-regulation led to slow growth. FIGURE 4. Phenotype of transgenic plants overexpressing SgCP12 or down-regulating SgCP12 expression in comparison with the wild type (S. guianensis cv. CIAT184). The photos show five-week-old (A) and 12-week-old plants (B). Plant height (C) and fresh weight per plant above ground (D) were measured 12 weeks after planting. Means of data from ten plants and standard errors are presented; the same letter above the column indicates no significant difference among the tested plant lines at P < 0.05. Chilling tolerance was assessed based on measurements of Fv/Fm, ion leakage and survival rate. Compared to the wild type, higher Fv/Fm and lower ion leakage was observed in S1 and S2; lower Fv/Fm and higher ion leakage was observed in A1 (Figures 5A,B). After 1 week of recovery at room temperature, 22 and 34% of the plants were dead in the wild type and line A1, respectively, while 95% of the transgenic plants were survival (Figure 5C). The results indicated that up-regulation of SgCP12 expression resulted in increased chilling tolerance, while down-regulation resulted in decreased chilling tolerance. FIGURE 5. Analysis of chilling tolerance in transgenic plants overexpressing SgCP12 or down-regulating SgCP12 expression in comparison with the wild type (S. guianensis cv. CIAT184). Fv/Fm (A) and ion leakage (B) were measured 8 d after chilling treatment at 6°C, while survival rate (C) was measured after 7 d of recovery at room temperature post chilling treatment. Means of three replicates and standard errors are presented; the same letter above the column indicates no significant difference at P < 0.05. Compared to the wild type, lines S1 and S2 had higher Pn (21 to 23%) and line A1 had lower Pn (17%) under regular growth condition. Chilling temperature resulted in greatly decreased Pn in all plants, but higher levels were maintained in lines S1 and S2 (37 to 51%) and lower level (41%) was observed in line A1 (Figure 6A). Activities of GAPDH and PRK, like Pn, were higher in lines S1 and S2 and lower in line A1 as compared with the wild type under control condition. Chilling inhibited the enzyme activities in all plants, but higher activities of GAPDH and PRK were observed in lines S1 and S2 and lower activities of GAPDH and PRK were observed in line A1 (Figures 6B,C). Aldolase and FBPase activities were decreased in all plants, but showed no difference between the wild type and transgenic plants overexpressing or down-regulating SgCP12 (data not shown). FIGURE 6. Net photosynthetic rate (Pn) and enzyme activities of carbon assimilation in transgenic plants overexpressing SgCP12 or down-regulating SgCP12 expression in comparison with the wild type (S. guianensis cv. CIAT184). Pn (A) and activities of GAPDH (B) and PRK (C) were measured before chilling treatment or 8 d after chilling treatment at 6°C. Means of three replicates and standard errors are presented; the same letter above the column indicates no significant difference at P < 0.05.
psaE is one of components of PSI, whiel CP26 is one of the minor antenna complexes of photosystem II (PSII) (Dekker and Boekema, 2005). rbcS encodes the small subunit of Rubisco that functions to catalyzes fixation of CO2 using ribulose-1,5-bisphosphate (RuBP) as substrate. Our results showed that, compared to the wild type, transcripts of psaE, CP26, rbcS and GAPDH were induced in the mutant 7–1, and higher levels were maintained in 7–1 than in the wild type during chilling stress. This is consistent with our previous observation that 7–1 had higher levels of PSII activity and Pn than the wild type (Lu et al., 2013). In addition, higher CAT2 transcript was maintained in 7–1 than in the wild type during chilling, which is consistent with that higher CAT activity was observed in 7–1 than in the wild type under chilling stress (Lu et al., 2013). The results suggest that the increased capacity to use the absorbed light energy for photochemical reactions and the Calvin–Benson cycle for protection of oxidative damages under chilling stress is associated with the chilling tolerance in 7–1. The mutant 7–1 was produced by gamma-ray irradiation (Lu et al., 2013). Deletions of DNA fragment and base substitutions are frequently observed in gamma-ray induced mutants (Yoshihara et al., 2013), which might be associated with the altered gene expression in response to chilling in 7–1 due to mutations in some transcription factors or in the promoter regions of the genes. SgCP12 transcript was greatly induced in both 7–1 and the wild type with higher level in 7–1, implying a potential role of SgCP12 in chilling tolerance in S. guianensis. The assumption was confirmed by transgenic plants. Overexpression of SgCP12 resulted in enhanced chilling tolerance with higher survival rate and Fv/Fm and lower ion leakage in transgenic plants as compared with the wild type, while down-regulation of SgCP12 led to a reduced chilling tolerance with lower survival rate and Fv/Fm and higher ion leakage. Our results suggest that SgCP12 expression regulates chilling tolerance in S. guianensis. This is the first report to validate the role of SgCP12 in chilling tolerance. In addition, SgCP12 expression influenced plant growth. Up-regulation of SgCP12 expression resulted in promoted plant growth with increased plant height and biomass, while down-regulation led to reduced plant height and biomass. The phenotype in antisense S. guianensis are similar to CP12 antisense transgenic tobacco and Arabidopsis double or triple mutants cp12-1/2 and cp12-1/2/3 showing a reduced growth phenotype (Howard et al., 2011; López-Calcagno et al., 2017). It is suggested that SgCP12 is a good candidate gene used for improving plant growth and chilling tolerance. The Calvin–Benson cycle provides plants with carbohydrates and the intermediates used for synthesis of other organic substances. Rubisco plays a key role in CO2 fixation using RuBP as substrates for production of 3-phosphoglycerate (3-PGA), which can be further conversed to GAP, catalyzed by GAPDH. Except for one PGA being used for biosynthesis of carbohydrates, five PAG are used for regeneration of RuBP, in which several enzymes including aldolase, FBPase, and PRK are involved. PRK catalyzes the last step of RuBP regeneration (Michelet et al., 2013). There was no difference in aldolase and FBPase activities between the wild type and transgenic plants overexpressing or down-regulating SgCP12. PRK and GAPDH activities were lower in antisense plants than in the wild type under both control and chilling conditions. Likely, reduced PRK protein levels were observed in Arabidopsis mutants lacking CP12-1 transcript, but Rubisco and GAPDH protein levels were not altered (López-Calcagno et al., 2017). There was a slight reduction in GAPDH and PRK activities in CP12 antisense tobacco plants although it is not statistically different (Howard et al., 2011). In addition, higher activities of GAPDH and PRK were observed in SgCP12 overexpression transgenic lines. The higher or lower PRK activity may promote or decrease RuBP regeneration and therefore increase or decrease CO2 assimilation in transgenic plants overexpressing or down-regulating SgCP12, respectively. Our results suggest that the altered activities of GAPDH and PRK are associated with the changes in Pn in transgenic S. guianensis overexpressing or down-regulating SgCP12, which in turn is associated with the phenotypes of transgenic plants. Nevertheless, the enhanced activities of the Calvin–Benson cycle enzymes promoted the usage of absorbed light energy for avoiding the oxidative damages induced by chilling in transgenic S. guianensis overexpressing SgCP12. KL, HQ, MZ, and YL conducted the experiments. ZG and SL designed the experiments and wrote the manuscript. This work was supported by the National Natural Science Foundation (31072074), Guangdong Provincial Science and Technology Project (2015A020209135), and Research Fund for the Doctoral Program of Higher Education of China (20134404110008). Marri, L., Sparla, F., Pupillo, P., and Trost, P. (2005). Co-ordinated gene expression of photosynthetic glyceraldehyde-3-phosphate dehydrogenase, phosphoribulokinase, and CP12 in Arabidopsis thaliana. J. Exp.Bot. 56, 73–80. Zhou, B., Guo, Z., Xing, J., and Huang, B. (2005b). Nitric oxide is involved in abscisic acid-induced antioxidant activities in Stylosanthes guianensis. J. Exp. Bot. 56, 3223–3228. Zhou, B., Guo, Z., and Lin, L. (2006). Effects of abscisic acid application on photosynthesis and photochemistry of Stylosanthes guianensis under chilling stress. Plant Growth Regul. 48, 195–199. Copyright © 2018 Li, Qiu, Zhou, Lin, Guo and Lu. This is an open-access article distributed under the terms of the Creative Commons Attribution License (CC BY). The use, distribution or reproduction in other forums is permitted, provided the original author(s) and the copyright owner(s) are credited and that the original publication in this journal is cited, in accordance with accepted academic practice. No use, distribution or reproduction is permitted which does not comply with these terms.